The first Polish immigrants to come to Southampton, New York were mostly farmers. The first settlers gravitated to the farm area of Southampton and used skills of farming to earn a livelihood. In 1886, a Polish immigrant named Francis Kruszewski settled in Riverhead, moved to Bridgehampton in November of 1889, and finally settled in Southampton in 1890. In 1895 Kruszewski was joined by Joseph Butanowicz , Aleksander Krzyewski, Antoni Zieliski, Leon Kryziemian and Isidore Roszko. By 1901 six families were located in Southampton and by 1910, this grew to 29 families and some young adults. 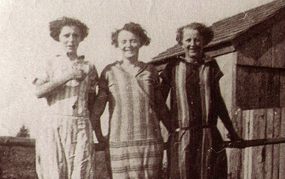 Francis Kruszewski's daughters on the Kruszewski Farm in Southampton; Jay, May, and Agnes. The church was an integral part of the immigrant's life. Many of the traditions of Poland were practiced in the new homeland, the blessing of bread and colored eggs at Easter time, and the blessing of homes each year. Father Joseph Cizmowski replaced his brother as pastor in 1923 and stayed here until he passed away in 1934. In the early years, the priests taught religious instruction and prepared the children for First Communion. Southampton, at the turn of the turn of the century, was an area containing several score luxurious estates and much rich farm land. As the population grew, the industrious Polish immigrants were well equipped to work at the wealthy summer residences as gardeners and caretakers. This offered seasonal employment for many to supplement their farm income. A building boom in the early 1900's offered still another source of income for the Polish settlement and many worked as foremen, mechanics, carpenters, masons, painters and small building contractors. The goal of this organization was to assist those in the Polish-American Community in the time of crisis, illness, or death. In addition, it served to propagate the Catholic Faith and Polish culture. Dues were fifty cents for a month, and seven dollars was paid to a member during illness. In case of death, the organization contributed $100 plus $1 per member to the bereaved family. The first meetings were held in the home of Aleksander Krzyzewski. By 1918, 331 families of Polish origin had settled in the area from Remsenburg to Montauk. These families traveled on Sunday to St. Isidore's Church in Riverhead; they came by railroad, horse and buggy, and bicycle to receive the Sacraments of the Church from Pastor, Father Rysiakiewicz. The St. Anthony Benevolent Society, with the assistance of Rev. Rysiakiewicz, petitioned the Most. Rev. Bishop McDonell, to establish a Polish Church and parish in Southampton. Permission was granted and Rev. Aleksander Cimowski was appointed to be pastor of the Polish Parish to be called Our Lady Queen of Poland. On Sunday, June 30, 1918, the first Mass was celebrated by Rev. Ciżmowski at Schwenk's Arcade, the building opposite the old Southampton Post Office, with about 100 people in attendance. The Drew property on Maple Street was to be the site for the Church. It was purchased for $13,325. The present rectory was included in the sale. This site was chosen for its proximity to the railroad station, since parishioners had to journey from as far as Montauk by train. The task to raise the founds for construction etc., was the job of the newly organized Our Lady of Poland Parish. St. Anthony's Benevolent Society contributed $1250 to the Building Fund. Five farmer families, some of the oldest Polish settlers in Southampton contributed $100 each to the fund. (...) To raise money, the Polish sold livestock, home made cakes, breads, and cut flowers. Due to World War 1, restrictions on building materials, no new building were being constructed. By using an existing building, it was possible to proceed. Ground was broken on October 21, 1918 and a "Temporary" church was completed on December 24, 1918. William Sandlewski, Michael Armusiewicz, and Frank Kruszewski were some of the men who helped in the construction. At 6 a.m. Christmas Day 1918, the first Mass was said in the new Church by Rev. Alexander CIżmowski. The first marriage was solemnized January 12, 1919, between Peter Kisiel and Bronislava Sokolovska. The first mission service was held on January 22, 1919 by the Redemptorist Fathers. Rev. Cizmowski taught catechism to the younger members of the parish. He would travel from town to town and teach groups of children at various homes. One home that was made available was that of Anthony Musnicki. Father Joseph Cizmowski replaced his brother as pastor and taught the children until his death in 1934. His brother. Reverend Alexander Cizmowski returned as pastor and arranged with some Felician Nuns from Brooklyn to teach the children on weekends. Thus, they traveled each weekend not only to teach religious instruction but also, the Polish language and folk dancing. During those years, the children periodically presented a pageant for the benefit of the Church as well as the enjoyment of our parishioners. Other pastors of the parish included Reverend Stephen Biedrzcki 1939-1943, Reverend Joseph Paprocki, 1943-1948; Monsignor Anthony Zasowki, 1948-1953; Reverend Theodore Wegrowski, 1953-1963; Monsignor John Cwalina, 1965-1967; Reverend Matthew Wisniewski, who celebrated the Golden Anniversary with our parishioners. Monsignor John Mirecki was pastor from 1978 to 1986 when Reverend Bruno Swiatocha became the pastor. Monsignor Edward A. Fus was the first assistant pastor in 1943, succeeded by several others. The present pastor is Reverend Stanley Kondeja. All of our Pastors devoted a great part of their ministry to the interests of the children. For many years, the young girls of the Parish belonged to the "Children of Mary" Society and assembled monthly in Church with their Marian Banner for Mass. There were also two choirs at the same time - the children's choir of young girls and the adult women's choir. Changing times, however, brought about the dissolution of these groups. Today, we are proud of our Polish Choir which sings beautiful Polish hymns at the eight o'clock Mass each Sunday. When dwindling enrollments and a strained economy necessitated dire changes, the Regional School of Our Lady of the Hamptons was organized. 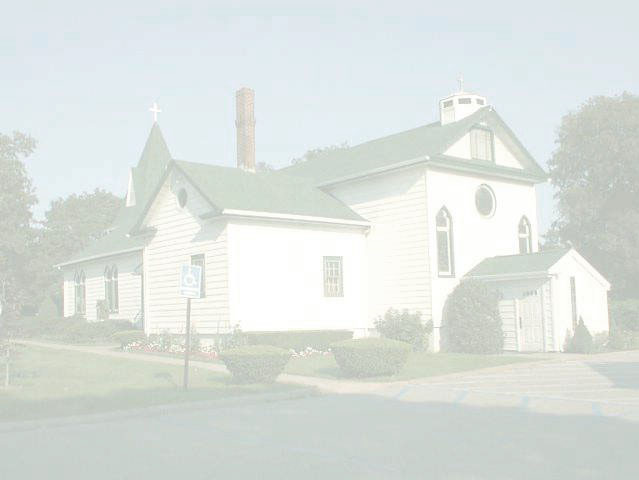 This was the successful merger of the facilities of three parishes: Sacred Hearts and Our Lady of Poland in Southampton and St. Rosalie's in Hampton Bays. The Regional School of Our Lady of the Hamptons was the forerunner of the numerous regional schools now located throughout our Diocese. All of our Pastors devoted a great part of their ministry to the interests of the children. For many years the young girls of the Parish belonged to the "Children of Mary" Society and assembled monthly in Church with their Marian Banner for Mass. There were also two choirs at the same time - the children's choir of young girls and the adult women's choir. Changing times, however, brought about the dissolution of these groups. Today, we are proud of our Polish Choir which sings beautiful Polish hymns at the eight o'clock Mass each Sunday. When dwindling enrollments and a strained economy necessitated dire changes, the Regional School of Our Lady of the Hamptons was organized. This was the successful merger of the facilities of three parishes; Sacred Hearts and Our Lady of Poland in Southampton, and St. Rosalie's in Hampton Bays. The Regional School of Our Lady of the Hamptons was the forerunner of the numerous regional schools now located throughout our Diocese. Today, we can look upon our flourishing Regional School with gratitude and justifiable pride. We gratefully acknowledge the work of the Sisters and teachers who so diligently strived for the attainment of the highest levels of educational excellence, first, the Sisters of the Holy Family of Nazareth and presently, the Sisters of St. Joseph. We acclaim with pride the progress and growth of the school where the curriculum has been expanded to include computer training, drama and the arts, pre-kindergarten and other numerous improvements in the school itself. In 1990, the increased enrollment necessitated the addition of St. Joseph's Hall to meet growing accommodation and in 1992 the pre-kindergarten classes were moved to the newly built Parish Center at St. Rosalie's in Hampton Bays. In 1999 The expansion of a second floor addition to the school was completed and dedicated to Bishop John McGann, former Ordinary of Rockville Center Diocese, and named McGann Hall. From time to time improvements and repairs have been made to our parish buildings, whenever necessary. On May 20,1956 the Church was rededicated and blessed. Just prior to this event, the building was renovated, adorned with new stained glass windows and a new organ. Improvements continue to be made and in the recent past, a new roof added to the Church and a new organ. The priests of Our Lady of Poland have also always played a dominant role in the spiritual welfare and development of our Parish. In essence, our beautiful Church and other Parish properties are lasting monuments of united parish endeavors - priests working together with parishioners. The growth of Our Lady of Poland Parish must also be integrated with the flourishing growth of our community at large. The past years saw the rediscovery of the Town of Southampton as a beautiful summer haven with its miles of beaches and unspoiled rural character. It is a well known fact that the Polish gardeners of the great estates became renowned for their landscaping artistry and the beautifying of many lovely treed streets in our village. In addition, they worked diligently on the farms and were so industrious, that gradually they acquired ownership of many farms. It is estimated that after World War II, over one-half of the farmland in the North and South Forks, belonged to the Polish farmers. In the consideration of our "Parish Family", we acknowledge many important components: our Pastoral Council, Finance Committee, Trustees, Ladies Guild, Rosary Society and Sacred Heart Society; also. Liturgical Committee, Lectors, Extraordinary Ministers, Altar Servers, Ushers, Choir and others who have all put forth that extra effort for their parish. In 1993 Our Lady of Poland Parish celebrated its Diamond Jubilee seventy-five years. It was a time of great celebration; a year of thanksgiving to God who so bountifully blessed our parish through the manifestation of faith of our people. Various events marked the occasion, which came to fruition on September 12, 1993, with a Mass of Thanksgiving offered by Bishop Alfred Markiewicz, a procession of former pastors and priests and dignitaries. A formal dinner reception followed at Pulaski Hall. Also, a Journal was published, documenting parish history and updated activities and events. Extracted from: Our Lady of Poland, Southampton, N.Y., Golden Jubilee 1918 - 1968 and Diamond Jubilee, Journal of Our Lady of Poland Church, Southampton NY (1993). In addition, the archives and photographs of the Kruszewski family, including a 1968 interview with May Doroski (maiden name Kruszewski) were used in preparing this webpage. May Kruszewski was the last surviving child of the first Polish immigrants Frank and Regina Kruszewski. May Doroski passed away in 2002 ay the age of 103.